Bakemonogatari is one of those Anime series that has a pretty large following but, from being on the outside, you’ve always wondered why that was the case. I mean the title itself doesn’t really sound like one that would stand out, even more, if you were to only watch clips or a trailer to the show, you’d probably choose to skip it. I know I sure did. My interest in this Anime series began when someone I was once close to started talking about it like it was the best thing since sliced bread. It was better than Evangelion they claimed, even stranger they said. But was it really? I don’t think so. 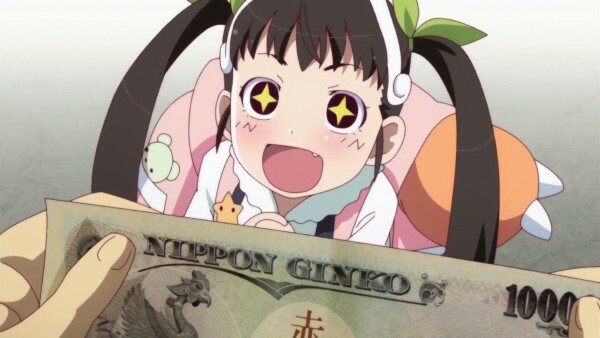 However, as a package, Bakemonogatari is still a pretty good series for anyone to get into. Read on to find out why. 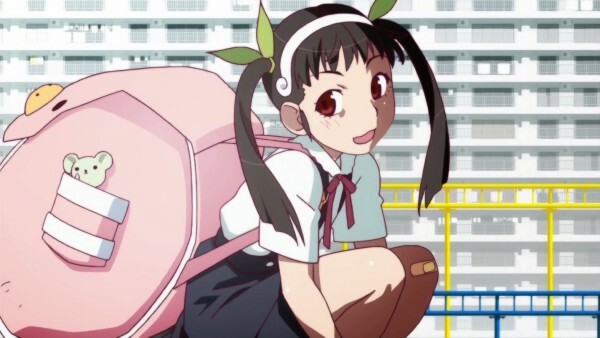 Bakemonogatari follows a small cast of characters that seems to grow as the series progresses. The story begins with Koyomi Araragi at his school when he saves a girl falling down from the top story of a stairwell. 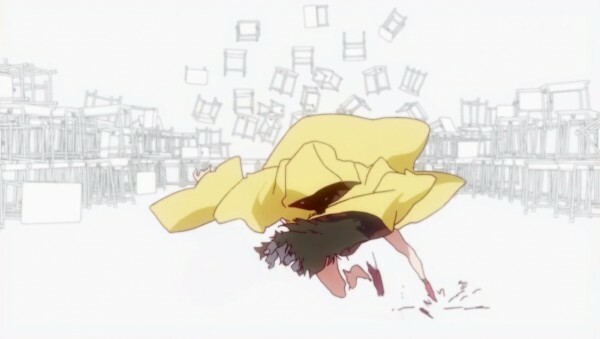 What made this odd is that the girl, Hitagi Senjyogahara, was completely weightless. It is here that the story of Bakemonogatari begins. It might sound like this is heading in the direction of some kind of monster of the week series, but really it isn’t. Instead the storyline of Bakemonogatari is spread into arcs where the main characters investigate into paranormal occurances that happen to other characters in the series. So far, after each investigation, the list of main characters have grown to include the character that’s case has just been solved. What’s particularly interesting is that not all of these situations are solved through violence. In fact, throughout the entire run of the first part of the season, there is only really one significant fight scene (and it’s kind of bloody). The only other fight scenes of note are comical violence against minors. Instead, the cases are solved by having the character infected with the curse or whatever having to do something significant to fight off that curse. For one character it’s returning to her home, for another it’s confronting the girl she is madly in love with. Of course, this is a SHAFT series and as such, does bring a lot of bizarre elements into the story mix. In this world, things like vampires, ghosts, and gods seem like the norm. Or at least this is the case for the main cast of characters. I don’t know what it is about the world-building in the series, but something just seems a little unnaturally off about the world the characters live in. Quick cuts the Anime. Like really, the director of this show uses these cuts more than Michael Bay himself. The first five minutes of the first episode left me with a gaping headache due to all the cuts and perspective changes. Eventually they settled on a view from the perspective of the protagonist, but it didn’t cure my head. The show itself is full of such strange direction, which feels really unnatural for an Anime series to have. Maybe it was to fit the tone of the unnatural feel of the show, or maybe it was just to give me a headache. Who knows. It’s SHAFT, its fans will eat it up as brilliance. That’s actually one of my main gripes with this show actually, the fact that the show has so many strange visual techniques shoved into it in an attempt to feel more brilliant. It’s like the team behind this show got together behind the seasons, had some really nice weed, and then collectively decided that whatever they came up with whilst high was brilliant. No it was not brilliant, you’d have to watch most of the quickly flashing panels of words in slomo to be able to read them and not only that, they get longer too. This was obviously lifted from the superior Evangelion movies, however, the novice director was all like “let’s lift this straight from there, the fans think Eva is deep, so if we steal their cinematography, we’ll be deep too”. I hate to use memes in reviews, but I think that the Anime meme “2deep4u” suits this show perfectly, at least in the visuals department. What was really enjoyable about Bakemonogatari was that it uses a different OP theme for each story arc. This was at first surprising to see as it is really unusual for a show to change themes only four episodes in. However, I am quite glad that the change occurred considering that the first opening theme was the weakest in the series so far. The best OP was clearly the second because it is so fun and catchy and is completely contrary to the theme of the arc that it represents. It is embedded below this review for your viewing pleasure. For this release, there is only the Japanese audio track available. So fans of English dubs will not be able to listen to an English track for this series. I am actually unsure as to whether one exists or not in product format from any publisher. However, a second language track is available and that language is one of an audio commentary by the cast of the series for each episode. To be completely honest, I don’t know if I should consider this release itself as an extra, or only what’s on the disc. You see, Hanabee have released this highly sought after series as an art-book with DVD sleeves up the back of the packaging. Even further, each disc includes commentaries for each episode (IIRC). 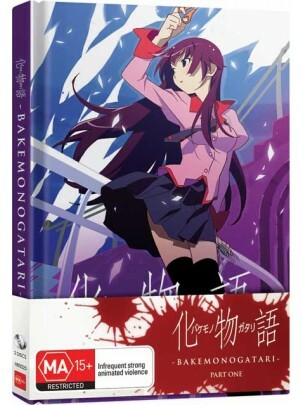 Bakemonogatari is definitely a collectors item itself, you must have this item. Overall, Bakemonogatari is an amazing package that all Anime collectors will want to own. Hanabee have really gone above the call of duty with this release. Even though I think the quality of the Anime series is higher than usual, but not one that lives up to it’s hype, it’s still definitely a must watch series. You will definitely be missing out by avoiding this release, or by not picking picking this up while you still are able.